"I was back in my old home in Miami, Florida where I used to live with my parents years ago. It was early in the morning and my mother was making me some cuban coffee which was my favorite. As she was making it, the strong fragrant aroma of dark roasted cuban coffee filled the house all the way to the living room where I was sitting. As I was waiting for my mom to bring me my coffee, I started to hear and feel a low humming, rumbling sound coming from outside the house. As I quickly got up and went outside to check what was making the sounds I had heard, I saw in the distance a Tsunami wave coming towards our house. I went back inside the house and started to yell to my mother that we had to leave quickly as there was a Tsunami wave coming towards the house. However, she seemed to be frozen, unable to move. As I continued to tell at her to move quickly because there was a Tsunami that was coming fast towards our house, she was not able to move so I grabbed her by the arm and tried to save her by pulling her quickly away from danger but it was too late. 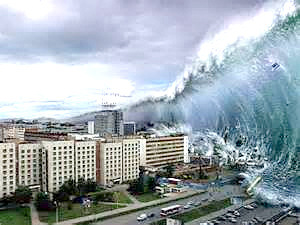 Suddenly the Tsunami waves arrived and crashed against the house and completely swept us away. As this happened, I woke up stunned." The house where I used to live with my parents in Miami, Florida was only about a mile from the Atlantic Ocean. I remember how I used to go fishing with my friends at Biscayne Bay and Brickell Avenue and the Beach was right there. I believe that the LORD has revealed to me what may soon happen in Miami and mostly all of South Florida. This is not the first time that the LORD has shown me Miami under water. I believe that I was shown my house because this is the location where this will happen. My mother in the dream represents all of my family that live Miami, Florida. The low humming, rumbling sound I heard in the dream is the sound that a Tsunami makes as it is approaching a coastline. The part of me trying to warn my mother as the danger of the Tsunami represents me trying to warn my relatives and the people who still live there. The part about my mother being unable to move as the Tsunami was approaching represents my relatives and those who live there who refuse to listen to what I am telling them, trying to warn them of the imminent danger that is just ahead. People are in denial, unable to believe that anything like this could happen. The ending of the dream is a terrible warning of what may happen if the people do not listen. In another scene of my dream, I went to little Havana in Miami, Florida and it was flooded. The streets were turned into rivers and the people who were in the streets, they were wadling in the waters waist deep or deeper. Many were not able to cross the streets because of the floods. I was taken to different places in Miami and it was all flooded. It was a terrible scene. Although this dream has been partially fulfilled with Huricane Irma hitting Miami and all of Florida, I feel that this is just the beginning of much worse things coming in the near future. The LORD is giving us warnings so that people may repent and turn to Jesus Christ before it is too late. Jeremiah 6:10: "To whom shall I speak and testify, that they may hear? behold, their ear is uncircumcised, and they can't listen: behold, the word of Yahuah is become to them a reproach; they have no delight in it."